Dr. Michael J. Wade is Principal Scientist of Wade Research, Inc.™, a small business that provides geochemical consulting services to a variety of government agencies, industrial clients, and law firms. Dr. Wade is an internationally recognized organic geochemist with 40 years of post-doctoral experience and over 50 post-baccalaureate years of strong technical and project management experience in a variety of research programs with special emphasis on study of organic contamination in the environment. He regularly provides expert forensic services both through deposition process as well as testimony in various U.S. Federal and State Courts in the areas of hydrocarbon fingerprinting, including assessment of sources of contamination, identification of petroleum product types, quantification of weathering effects on petroleum products, and age-dating of petroleum product releases. Dr. Wade has extensive peer-reviewed technical publication experience and is a chapter author of a text book chapter on forensic geochemistry and environmental damage assessment. In addition, recently Dr. Wade has authored three highly regarded peer-reviewed journal editorial opinions on aspects of the technical execution of environmental forensic investigations. Since 1992, working through Wade Research, Inc., Dr. Wade has been engaged in the conduct of multiple projects dealing with the various aspects of environmental assessment, including assessment of the degradation of petroleum hydrocarbons, development of quantitative hydrocarbon fingerprinting techniques that identify sources of petroleum contamination, and quantitative assessment of fluxes of petroleum hydrocarbons to the environment. Over the past twenty-seven years at Wade Research, Inc., he has refined quantitative field and laboratory investigation approaches that are designed to establish time frames for the release of gasoline, kerosene, diesel fuel and heavier fuel oils in subsurface petroleum contamination cases. His assignment approaches currently measure geochemical differences in petroleum contamination originating from sudden releases of petroleum products in the environment and compares the result to more chronic releases occurring over a number of years. The overall approach includes the evaluation of time horizons for the release of a variety of petroleum products to the environment. Annually, through Wade Research, Inc., Dr. Wade conducts approximately 20 to 30 such programs for clients throughout North America. Dr. Wade also has been appointed by foreign governments to two expert committees on environmental damage assessment. Dr. Wade has conducted multiple statistical source allocation and dioxin/dibenzofuran hydrocarbon fingerprinting assignments using established state of the art statistical approaches under a variety of circumstances including municipal incinerator impact assessment, multiple Superfund source allocation assignments, and Agent Orange manufacturing site impact assessment and source allocation assignments. Dr. Wade has testified as an expert witness in U.S. Federal Court as well as State Courts litigating dioxin/dibenzofuran cases. In addition to his regular assignment mix, since 2002, Dr. Wade has taught numerous forensic geochemical continuing education courses for a variety of state and professional society venues throughout the United States. Such courses provide today's environmental professionals with a broad background in organic chemistry that is then focused down to specific tools that investigators can use to develop information on anthropogenic contaminants that lead to allocation discussions and/or legal responsibility resolution. Moreover, since 2010, Dr. Wade has taught a series of highly regarded petroleum forensic courses at Rutgers, The State University of New Jersey, including advanced petroleum forensics, PAH forensics and petroleum age dating courses for the NJ Licensed Site Remediation Specialists (LSRP) program. 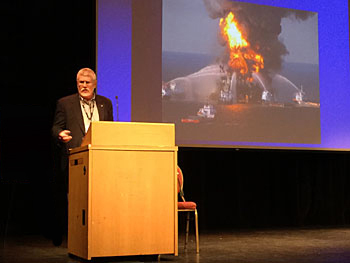 In 2018, Dr. Wade presented two newly-developed courses: the first working with an internationally-recognized hydrogeological expert on advanced statistical visualization techniques for petroleum and dioxin/dibenzofuran litigation purposes; and the second working together with an internationally recognized environmental trial attorney on petroleum release age dating for different petroleum products within today's current litigation requirements. In 2019, Dr. Wade is partnering again with the same two internationally recognized legal and hydrogeological experts to offer a new 3.5-day course at Rutgers on the use of petroleum age dating approaches in legal proceedings that includes attorney-led preparation for and participation in expert testimony in both deposition and trial settings using technical information from real life past litigation cases. Copyright © 2014-current Wade Research, Inc. - All rights reserved.